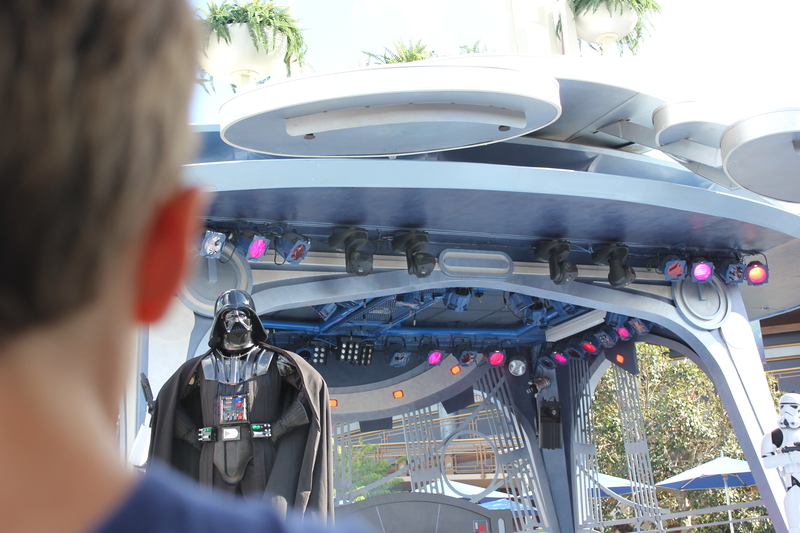 uch like Luke Skywalker, my son rushed off to face the Dark Side of The Force before he was ready… and lost. We’re spending the week in Disneyland. Last year when we were here we were disapointed to learn that Star Tours was closed. The good news was that they were in the process of an upgrade, and the new Star Tours allegedly rocks the socks off the old one (still haven’t been on it yet). Never-the-less, this was the year we were going to have the full-on Star Wars experience at Disneyland. We’ve been talking about “The Star Wars Ride” for months now. It’s definitely on our must-do list. The other major Star Wars event at Disneyland is the lesser-known (though not to any competent Dorkdaddy out there) Jedi Training Academy. At the Tomorrowland Terrace Disneyland Cast members come out in full Jedi Master garb and pick a lucky bunch of kids out of the audience to “train” as young Jedi. They get to wear Jedi robes and get to practice saber moves with “training lightsabers”. At the end of the event Darth Vader and a couple of Storm Troopers (as well as another Dark Lord of the Sith who most definitely was NOT there when I vetted the show last year) come out and the young Jedi get a chance to practice some of their new-found saber skills against some real bad guys. Naturally I decided this was something my kids MUST do… for THEM, not for me. In any case, the age range for participants was 4-12. Was I going to let that stop us? No way. After a little coaching, if anyone asked my son how old he was he would say with confidence “Four!” and put three fingers up as proof. *sigh* Close enough. (Nevermind that he’s actually three. Keep your comments about my turning him to the dark side to yourself) As it turned out, my daughter wasn’t interested, so she didn’t sit down in the crowd from which the young Jedi are picked. When it came time there were probably 100 kids in the pool, for maybe 25 spots. My boy didn’t get picked. But that was all right. I prepared him for that possibility. We had my iPhone lightsaber app. (seriously the coolest app ever made) which seriously trumped those “practice lightsabers” the chosen kids got, and we had front seats for the show. We watched the show from the crowd, and practiced the Jedi lightsaber moves with the iPhone from where we sat just in front of the stage. Then it happened. “Darth Vader’s Theme” played, and the bad guys made their enterance. Two stormtroopers for comic releaf, and then the real threat — Darth Vader himself and Darth Maul (from Episode 1 – The Phantom Menace). Darth Vader stands up onstage with smoke behind him looking all menacing, and Darth Maul comes out with all sorts of fancy swordplay and martial arts. If you don’t know him, Darth Maul’s one serious dude. He’s supposed to be something right out of your nightmares (that’s what George Lucas told the designers when they were coming up with Darth Maul’s “look” in pre-production). So Darth Maul comes out flipping, kicking, whooshing his lightsaber around, and looking all scary. As he’s doing his thing, snarling at the audience, he just happens to get about six inches in front of my 3-year-old-son’s face in full scary-snarl mode. Have I mentioned the fact that my 3-year-old son has never even seen the character Darth Maul before? To all you prospective Jedi out there, Yoda was right. Don’t rush out to face the Dark Side if you aren’t fully trained. To all you Dorkdaddy’s out there, don’t let your own ambitions push you to push your kids farther than they’re ready to go. Please spell my name correctly when you nominate me for “Father of the Year”. My official candidacy picture is the one of my 3-year-old son with swollen, red eyes after 15 minutes of inconsolable crying out of sheer terror. He has his Dorkdad to thank for that one… and for the inevitable nightmares that we’ll be dealing with for the forseeable future. 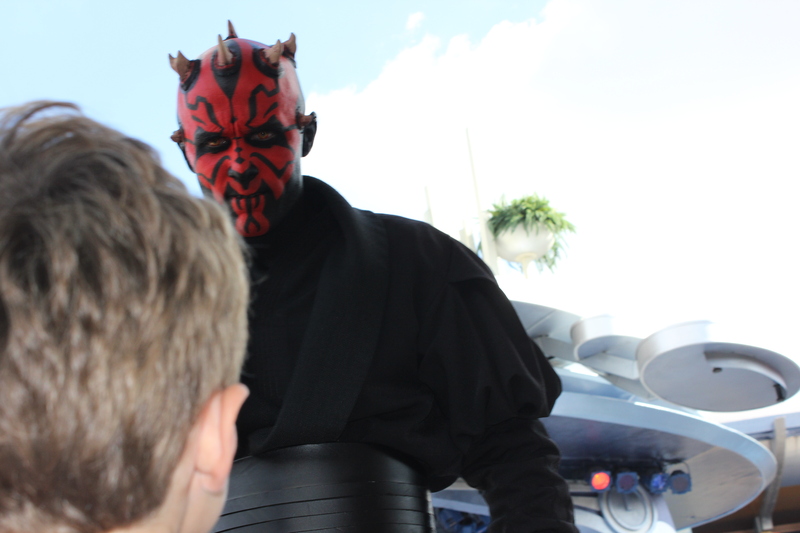 UPDATE: For an account of the rematch between Darth Maul and my son just two days later, check out this link. His scars should heal soon enough. I’m nnot sure about mine. Poor kid. There’s nothing worse than seeing a 3-year-old come totally unglued, and knowing it’s your fault. Hey, Daddy, be gentle on yourself. It is not entirely your fault. You were new to the display. Was there a young child be warned sign in plain view? I place some blame on Walt. The Happiest Place on Earth should NOT have scarey bad guys jumping out and getting into the face of very young children.